Changing out your tires each season can seem really complicated. However, one thing that you can do is learn all that you can about tires to make it a little simpler and easier. That way, you will have an easier time changing out your tires when the time comes for tires that are more suited for the other seasons. One thing that you can do is buy some wheels that are every bit the same as the wheels you have on your vehicle. Then you can mount them with the proper tires for the season. That way, when the time comes to change out the tires, you will just have to exchange the whole wheel. This will save a lot of work. 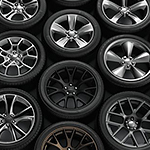 Changing the wheels is inexpensive as an alternative to mounting tires on your vehicle. For more information on what you can do in order to make sure that you are saving money, you can visit Volvo Cars Wellesley and talk to our tire experts.